Teach your child healthy habits. If you are concerned about your child's weight, you may be considering some diets for overweight toddlers. While being overweight is a concern, even for small children, you must be careful about implementing a diet plan. Diets for toddlers are far different that diets for adults, so forget about Weight Watchers for babies. Learn the safe way to control your toddler's weight. Frequently, parents worry about their toddler's eating habits. They seem to eat very little and refuse what would seem to be a normal balanced diet. What is a parent to do? First, stop worrying. It is normal for small children to be picky eaters. They aren't quite ready for adult foods so an elaborate meal may just be more than they can deal with. They also have smaller tummies so they can only handle small, simple meals. However, if your toddler is overweight, you may have a reason to worry. An overweight toddler has a high probability of being overweight when he is an older child as well. The prevalence of overweight children in the United States aged two to six is almost 14 percent. As children get older the number gets higher. In fact, about 80 percent of children who are overweight become obese as adults. Obesity leads to countless health problems such as diabetes, cardiovascular disease, high blood pressure and more. For children to avoid this outcome, they need to learn healthy eating habits from the very start. The best place for them to learn healthy habits is at home. Eliminating or limiting these factors is essential for diets for overweight toddlers as well as adults. If your toddler is overweight, you can't just hand him a Slim-Fast and expect him to be healthy. You need to provide him with a proper diet. This means limiting things like milk, juice, sweets and snack foods. It also means paying attention to serving sizes. Toddlers only need about a quarter of what an adult serving would be. This doesn't mean a quarter of what you can eat. This means a quarter of a standard serving size as determined by the USDA. If you look at it in terms of calories, a toddler needs about 40 calories per inch of his height every day. So an average toddler should consume about 1300 calories each day. Diets for overweight toddlers should consist of foods that provide enough calories while also providing all the important nutrients that a child needs to grow and develop properly. 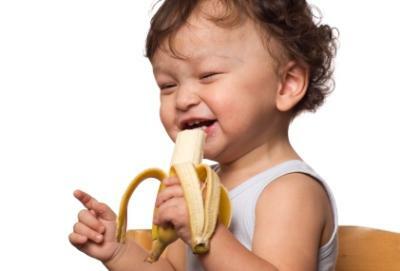 Instead of a donut, give your toddler a banana; instead of sugary drinks, give him water. Don't let him fill up on milk and juice. These are fine in moderation but will not provide everything he needs and will spoil his appetite for other foods. If you eat junk, so will your toddler. Why not resolve to make some healthy lifestyle changes in your life and your child's? Start by eating healthy foods, but don't stop there. Instead of parking in front of the TV, go for a walk, play tag or put on some music and dance. If you do it, so will your toddler, and you will both be healthier for it.